Chagas Disease is caused by a parasite, Trypanosoma cruzi, and is quite prevalent in Central and South America. It is also known as American trypansomiasis. Although most folks may not be familiar with Chagas disease, they might recognize the disease after hearing its common term, the "kissing bug or Assassin bug ". Trypanosoma cruzi is carried by the “Kissing Bug” and is spread by the feces of the bugs. The Kissing Bug feeds on blood usually around the eyes and mouth of a pet while they are sleeping. The bug is not just a pest for people living in Texas. 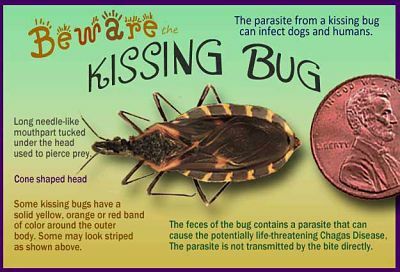 Kissing bugs are found throughout the southern half of the United States, especially Texas, New Mexico, Arizona and along the U.S./Mexico border. Kissing bugs love to hide beneath porches, between rocks and cracks of cement, in wood and debris piles, dog houses, kennels, chicken coops, and your home. Yep, pretty much anywhere. Kissing bugs are easy to identify because of their unique cone-shaped head, two long, thin antennae and spindly legs attached to a dark brown to black bulbous body with red, orange, or yellow stripes along the edges. Chagas disease is transmitted whenever a kissing bug bites an animal, defecates T. cruzi and the parasite enters the bite opening. The good news is that not all kissing bug bites result in Chagas disease. In most cases, your pet will only suffer from short-term swelling and fever, not full-blown Chagas disease. The symptoms of Chagas disease in humans, dogs, and cats begin with swelling at the bite sites, fever, fatigue and swollen lymph nodes. Younger infected animals seem to develop more severe disease. The initial signs of Chagas disease in pets last about 30 days, and then appear to lessen. Usually, within 8 months of infection, the severe and chronic form of Chagas returns and persists until the animal dies. There is no treatment currently available for Chagas disease in dogs or cats. Many infected dogs are euthanized once the diagnosis is confirmed. For humans, treatment is only available through the Centers for Disease Control (CDC). It’s that serious. Humans treated by the CDC have a very guarded prognosis for complete recovery. DoglopedixChagas Disease is caused by a parasite, Trypanosoma cruzi, and is quite prevalent in Central and South America. It is also known as American trypansomiasis. Although most folks may not be familiar with Chagas disease, they might recognize the disease after hearing its common term, the "kissing bug or Assassin bug ". Trypanosoma cruzi is carried by the “Kissing Bug” and is spread by the feces of the bugs. The Kissing Bug feeds on blood usually around the eyes and mouth of a pet while they are sleeping.